Laying in a cold tent, nestled deep inside of a huge, puffy down sleeping bag, fashionably dressed in the latest in 7000m lingerie (eg. down suit) is about the most comfortable place to be above 6600m and at the crack of dawn. This morning was no exception. It was 8am and the sun STILL hadn’t reached our tent and all of my water bottles were frozen. Given that Chad had given us a 9.00am set-off time I knew that I’d have to get moving. It seemed however, that Chad had similar appreciation for his sleeping-bag and down-suit combo as he shouted across to our tents to see if we’d be happy to postpone our departure time to 10am. I certainly wasn’t going to complain…! We left at 10am sharp, just in time to see the sun hit the face of wall that we’d have to climb to reach our 7000m ‘tag’ before descending back to Camp 2. The route started with a gentle snow-slope, up to a rock band, through a steep icy section and evening out at a 7000m plateau. 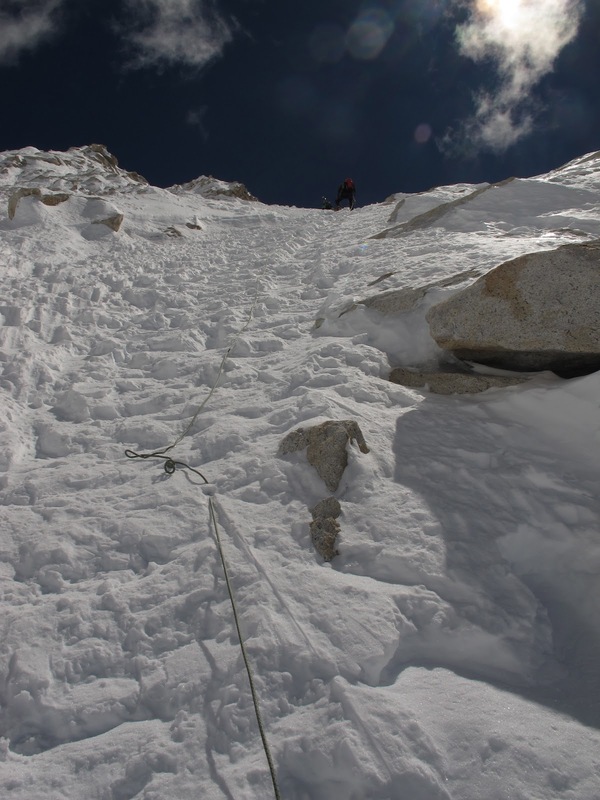 A challenging climb but on mixed terrain which made for an interesting route which kept the brain alert and engaged. In spite of the slow start and cold conditions, I must admit that it turned out to be a thoroughly enjoyable climb and absolutely stellar day. Chad, Valdes and I managed in just about 4 hours including several breaks to watch Sergey and Adrian’s absolutely epic ski from 7200m through the deep powder bowl to the right of our route. It was one of those unforgettable Himalayan days with blue skies, heaps of sunshine, no breeze and plenty of laughs. Topping out at 7000m, looking across at the NE Ridge of Everest and into the snow covered peaks of Tibet reminded me of how lucky I was to be on such a spectacular route with such a great group of people. We made a quick descent and met with Adrian and Sergey who had been lounging in Camp 2 following their ski descent.